It’s been 2 weeks since we welcomed our sweet babies, actually our new kittens, into our home and it couldn’t have come at a better time. My 15 year old son took one look at one (supposedly the more outgoing of the two) rolling around and said that kitten reminds him of a cannoli because of the contrast of the solid white on his tummy against the grayish stripes on the rest of his body. And just like that, my son proclaimed with a grin, that he should be named Cannoli. I laughed because he is characteristically usually thinking food, but I kind of liked the name. So then my children and I agreed that their names should have a theme and since Cannoli is an Italian dessert, we’d find a French dessert name for the other. After a quick google search, we landed on Beignet, which was PERFECT because my husband has made beignets (our first time ever having this dessert) twice to help my son earn extra credit in his French class. So there you have it, our kittens are named Cannoli and Beignet. As it turns out Beignet is the more outgoing of the two and Cannoli is more chill. Cannoli is also completely litter trained unlike his brother. In June, my coworker was going around telling folks about a litter of kittens that her mom’s cat had and they needed a home. I jumped in right away and not only said that I wanted one, but I was thinking about two. The look on her face was of surprise and delight. I had never been so sure of anything in a long time, at least sure of one kitten, but I had thought about maybe two in the past so they wouldn’t get lonely while the family was away at school and work. You see, my children and I created a 2016 vision board in January and a picture of a cat is on there. Yup, I told my husband that this was the year, so he’d better get his mind right. I’ve missed having cats, and in the 19 years of living in Texas, I haven’t had one, except for the neighborhood cat that we feed sporadically. The kittens are a complete joy and everyone, including my husband, is in complete awe of them (ok…maybe my husband isn’t in complete awe, but they make him smile a lot, especially when they fall asleep on his lap). I know families who have pets when their children are much younger than mine, but my son used to be allergic to both cats and dogs, so that was a big part of the reason that we didn’t have pets. When he was tested a few years ago, we found out that he was no longer allergic to cats, but still allergic to dogs. Now my children are ages 15 and 10 (11 next month), which is old enough to really appreciate and help take care of them. It’s been a joy to see how loving my children are to them. This really was the perfect time to receive them into our home because we’re getting them litter trained while we’re still on summer schedule and we have more time to play and enjoy them before the school year hustle/bustle starts. Plus, with my husband’s surgery in May, and disappointment with not making it to Florida for my cousin’s wedding that same month (see my first post), we needed a burst of joy. I see why some animals make great therapy pets. Pets don’t judge you. They just want to be loved and cared for. This whole experience makes me think about how you have to open yourself up to receive joy. I wrote a previous post in response to the daily word prompt about being open. I’m convinced that being open is a conscious decision that you have to make. I could be bitter about a lot of things, but it’s my decision on how negative experiences affect me. I know it’s easier said than done, but it takes work, and for some, fight. If negative internal dialogue is an issue, then it will take consistency to keep your internal dialogue positive and in check. I could type more, but I want to end noting that there is a lot of misfortune, hate and injustice in the world, but seize opportunities to receive and express joy. Be grateful. Make room for the sweet stuff. Last night, I spent hours “shopping” in my closets because in just 2 weeks, I’ll be traveling to Jamaica for my 25 year high school reunion. My passport finally arrived yesterday and the realization hit that I need to work on a wardrobe game plan. I did type “closets” and not “closet” because at one point, I had clothes in everyone’s closet, but my son took a stand one day and moved my clothes to the garage. By the way, he gets his feistyness from me. Since we downsized some years ago from a house to a duplex, the space has been limited, especially the closet space. My excuse has been that I went from a walkin closet to one that is about a quarter of that. Yes, that’s a big difference. As much as I would love shopping for new clothes, it just isn’t feasible at this time although I did buy one new dress a few weeks ago. We’re paying for my daughter’s summer camp and my husband just went back to work this week after being off for nearly 2 months since his surgery. The thing that I battle against is the sense of entitlement that I work hard, I take care of my family, and I’ve earned it, therefore, I deserve to splurge. Now, I do believe that I should treat myself, but at what point does acquiring new clothes, new shoes, new gadgets, and new stuff become enough. About 10 years ago, I thought that maybe I did have a problem when my oldest sister was perusing through my closet and referred to me as having a “sickness” due to my shoe collection. Ouch. That was a bit harsh and an exaggeration considering the source, but I’ve never forgotten that. I think that in my case, some of it is compulsion, some of it habit, and dare I suggest, some of it may be filling a void. My family was poor, therefore, I didn’t have a lot growing up and I vowed to make sure that I had more than I needed when I got older. I made that vow as a preteen as a result of this one white bra that I owned which had to be hand washed every night. One night my mom yelled at me because I didn’t feel like washing it and it was dingy with a capital “D”. The fear of scarcity definitely motivates some of my behaviors and this extends beyond clothes. However, outside of my personal realm, society does put the pressure on in the messaging that we aren’t enough in attempts to make people buy things to look and feel successful and happy. Social media causes people to make constant comparisons. I wouldn’t be telling the whole truth if I didn’t acknowledge that I’m prone to internalizing some of these messages. Interestingly, there are aspects to living a minimalist lifestyle that really appeal to me such as living against the mold, freedom from being physically and mentally bogged down, and making room for more spiritual connection and enjoying experiences with people rather than things. The truth is that I want those things and I need to reassess to see if I’m living in a way that will get me there. We downsized our home due to the economy and my husband’s multiple layoffs. Despite the circumstances, I found it to be a blessing because since then I’ve learned that I could make any place a cozy, home. I’ve learned that as long as my family is together, nothing else matters. I’ve learned that the type of home I have isn’t a measure of my success or failure. I also learned about the positives of living in a small space such as there being a smaller cap on how much stuff you can bring into your home. This has, for the most part, forced me to re-evaluate old things as I bring in new things. I purge more frequently than I have in the past, which is a bonus. I actually enjoyed shopping in my closets last night. I’m a little embarrassed to write that I have so many clothes that I sometimes forget what I have. Maybe someone else can relate. I have mostly separates, and every now and then, I’ll put an outfit together that I really like, but I’m unable to replicate it on a different occassion because I forgot what I put together. This all prompted the idea to coordinate my outfits and take a picture of each outfit including the accessories. I have a work trip scheduled the same week as my trip to Jamaica, so I didn’t want to wait until the last minute. That hours long exercise allowed me to not only coordinate some great options, I gained a greater appreciation for what I have. This message extends well beyond clothes. I encourage others to take the time to take a look at what you have, purge what no longer serves you, make room for meaningful experiences, and be grateful. I see why kids love arts and crafts so much. As I mentioned in the previous post, I’m working on a little project for my coworker’s going away party this week. In the process, I rekindled my love for creating things with my hands. I’m not that good, but this is a nice, relaxing way to end a Sunday night and combat the upcoming work week hustle/bustle blues. As I write this, I’m inundated with a flood of emotions due to the recent deaths. It’s amazing to me how humans are able to function despite inner turmoil, helplessness, fear, anger, distress, sadness, ambivalence, uncertainty, feelings of powerlessness and even terror. People experience these emotions daily, sometimes simultaneously, as they experience the injustices of this world, yet continue to go to work, go to school, and carry out their daily lives. I struggled on what to write this week because I tend to focus on the light hearted, positive, and things that can be done within one’s control to take care of self, but my heart is heavy. Too heavy for the post I drafted on Thursday, but never published. It’s too heavy for the pink hearts in the picture I took and shared in this post, but I will circle back around to its significance later. This post will be different from my others because I tend to not write about these sorts of things although they impact me a great deal. I’m Haitian American married to an African American and we’re raising a son and a daughter in this world. The color of our skin is evident upon first laying eyes on us. The color of our skin definitely impacts the way we raise our children. Truthfully, I haven’t been able to really articulate my feelings. It’s a combination of helplessness, sadness, anxiety, hope, gratefulness, and uncercertainty as best as I can tell right now. My family has experienced abuse when I was a child. By my family, I mean my mother and her 4 children, which includes me (the youngest), at the hands of my father. A thought came to me when I learned of the Dallas police shootings and that was this is what happens in an abusive relationship. The abused is beat down (the best I can do right now in terms of clinical terminology as a social worker) and tormented mentally, psychologically, and sometimes physically. There is also a shrouding of secrecy in abused families. The abused will plead, beg, adjust behaviors, and sometimes even tell someone as attempts to stop or reduce the abuse, but it falls on deaf ears and the abuse continues. This all becomes internalized. I view the shootings of the police officers as direct result of what happens when one has been unheard and unseen repeatedly. The abused decides that enough is enough and takes matters into their own hands. It is not the solution, but in that moment, it appeared to be the best option. Think of the countless women in prison, incarcerated for killing their abusers. This is all I will write about my thoughts on the shootings and racism in America because I know there are a lot of opinions. I don’t want to get into that nor simplify the magnitude of problem. What I want to focus on is how to live a meaningfil life in a world with so much injustice going on that is out of one’s control. Yesterday, I went into a store where everything is $1. The store is aptly named the Dollar Tree and I was looking for items for a party at work. 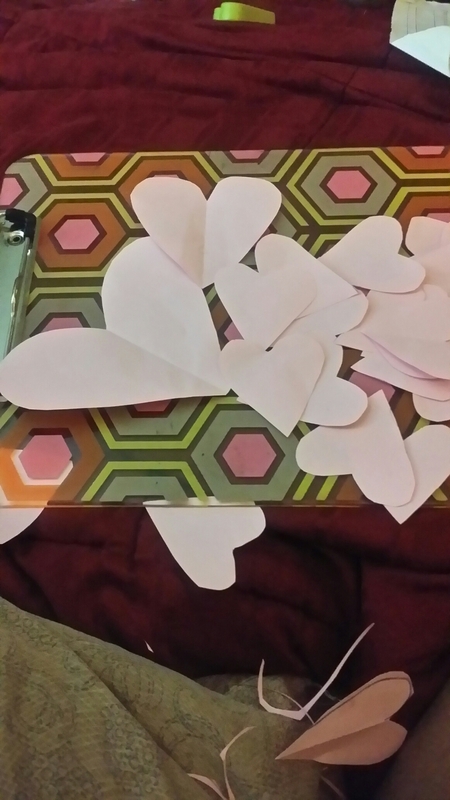 We’re throwing a going away party for one of my coworkers and I had everyone at work write a memorable message for her on the pink hearts (in the picture) that my daughter helped me cut out. 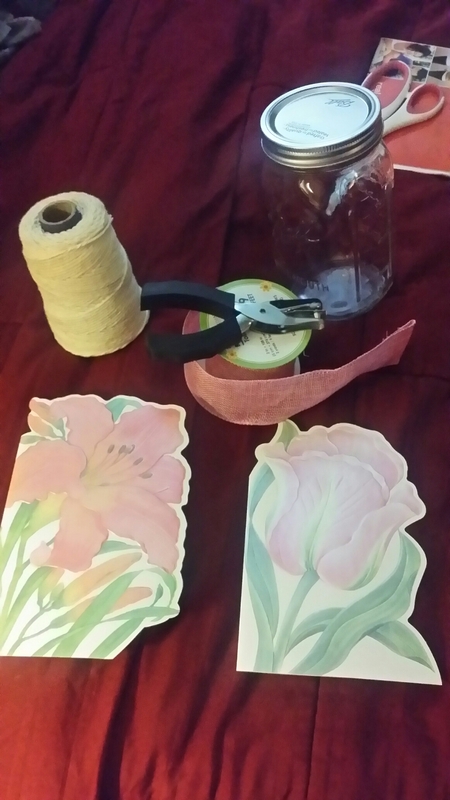 The hearts will be folded, placed in a mason jar and presented as a gift . 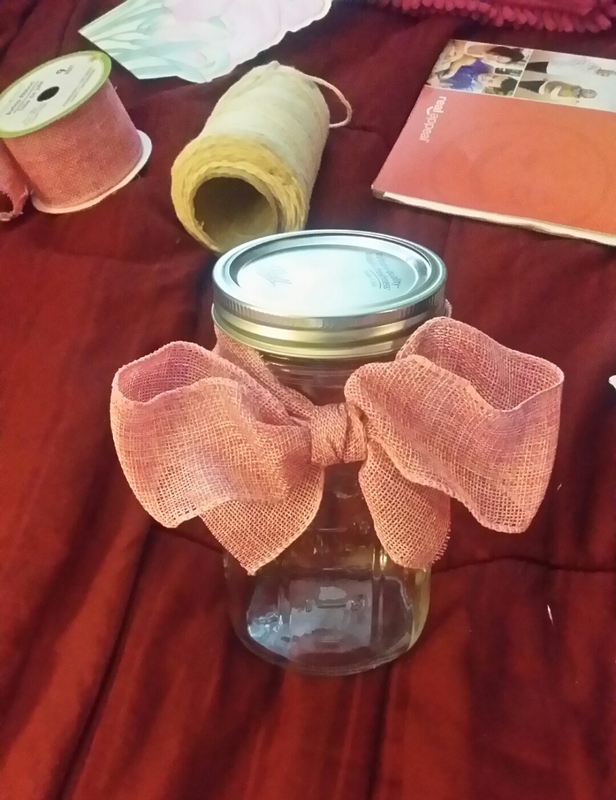 At the Dollar Tree, I found a cute reddish ribbon to wrap the mason jar with. I was in line assessing (really judging in my head) a family in front of me. I recognized the woman, but I couldn’t place from where. I eventually thought that she might have been a cashier at one of the grocery stores I frequented. I assessed that in this family was the woman who was with her adult daughter and her daughter’s 3 children. Two of the children looked a little unkempt and one had matted hair. I observed them unloading their cart full of processed snacks and drinks. Things I would never buy my kids. I observed the two women mouthing the number of items, estimating the cost of their purchases. I admit I was staring too much, but I am a people watcher. The woman that I recognized gave me a gentle smile a couple of times and then exclaimed she loved my dress. I made the assessment that she was kind and warm. I said “thank you” and continued to be bothered by the belt full of processed food that they were purchasing. I began to think that maybe this is all they could afford. I thought about how privileged I was for being educated on the benefits of making better food choices and having the financial ability to do so. The woman put an item separater in front and one behind my items. Every now and again, she would tell one of her grandkids to behave in some way. There was a moment where I thought she knew I was staring too much and cleverly attempted to break my gaze by being overly gracious. That could have been my guilt. Whatever the case, I eventually thought to myself, “here you are judging these good people and for what”? They are kind. There are huge problems in this world like racisim, poverty, hunger, wars, rapes, slavery, kidnappings, persecution (to name a few), that may not be resolved in my lifetime. In fact, I do not believe that they will be resolved without an act from God. It can be overwhelming. But I think we were put on this earth to make connections with each other. Being kind and making meaningful connections with people, even if for brief moments, gives hope. In the same way that I will fill the mason jar with positive messages of hope to give away as a gift, making meaningful connections with people fills our hearts with hope that we can give as gifts to others. I think being kind, listening and really trying to understand another person’s experience (people we come across every day) brings out the best in us. This expression of love is within our control and is something that each person can take action on now. Where do I begin with this week? It was long, grueling, draining, deflating, and even ridiculous at times, but not without some moments of joy interwoven in there. The fact that I haven’t written a post in a week is telling. My plan was to finish my first month as a blogger with at least 10 posts. I was so close with 9, but it didn’t happen, mostly because of how busy my work life has been. Although I was pretty much flying by the seat of my pants, I did manage to take care of myself to some degree mostly due to my daily routines. Sunday is the start of my exercise/planning week, so I made sure to pack my gym bag for the Zumba fitness class that I teach after work on Mondays and Tuesdays. I also prepped my green smoothies, breakfast and lunch so that I would have more time in the morning to get dressed. I’m not always this good, but I do have a problem with leaving the house on time. I’ve been working really hard on this and although I didn’t leave at the time I envisioned not one day this week, I did manage to get to work by 8:45 am most days, which is an improvement. I barely remember what transpired Monday, but I can say it was the start of my work week. I start each week day reading a daily devotional, having conversations with God and really trying to hear him. I don’t seem to keep up with the devotionals on the weekend, but I find that the office is where I really need to practice my Christianity. On my way home, I called my mom despite being hesitant because I didn’t know if she would be awake. I missed her voice and it has been a part of my routine for years to call her on my way home. I’m still getting used to the change in schedule, which explains why I forgot to call earlier. I told her a few weeks ago that I would no longer call her between a certain block of time because I noticed that was her “rest” time. And I’m in for a fight if I (or any of my siblings) call it “sleeping”. It’s, “I was just resting” or “I was closing my eyes”. To my surprise, she was awake, but she didn’t have a good couple of days due to pain. Naturally, listening to her complaints, I put my social worker hat on to help problem solve. I even went home and researched some things on the internet for her. At times, I’m convinced that I became a social worker just as so that I can help my family. Those skills do come in handy. Tuesday was another smooth day. I started out with exercise, which I love because not only do I get to cross it off my list before I leave the house, it also pumps me up with endorphins and provides a great boost of energy. I had a doctor’s appointment in the afternoon, so I knew I wouldn’t be teaching Zumba fitness after work. My endocrinology appointment went well and the doctor even agreed to less frequent appointments. The ridiculousness must have started sometime in the middle of the week because Tuesday sounds uneventful as I type this. As I move to Wednesday and beyond, it’s a blur. I was experiencing a heavy dose of stress at work related to deliverables and deadlines. I found myself expressing my discontent several times, but I managed do this professionally. I like to say that I’m raising “concerns”. I was forewarned that what I was working on would be painful and I was starting to feel the sting. Even though I left work feeling heavy mentally, I decided to attend the Zumba fitness class of a fellow instructor that I admire so much and love the way she moves. I was so glad I did because I had so much fun. It relieved a bunch of stress, and had I not gone, she might not have asked me to do a favor for her which I was honored that she asked. Thursday was a smooth trip downhill, but I managed to help “free” one of my coworkers by validating her work experience. I refrain from writing about my job specifically because, quite frankly, I don’t know if I can in this forum, but the job can be ambiguous, grueling, deflating, exhilarating, is highly politically charged, and can also be rewarding. Spending a few minutes making that connection with her was very rewarding for the both us. Up until that point, we had not had that as in depth of an interaction before, mostly because she works in a different unit, but we do see each other in passing. Again, a reminder that although I work with exceptionally smart people of different disciplines, my skills as a social worker are unique and I can make real connections with others, even though I am no longer a clinician. I don’t want to go as far as to say that my coworkers are my new “clients”, but I’m there to help. I am going to spare everyone Friday because it was a mess! The work stress this week was tipping the scales. I felt out of balance. After a great couple of weeks of sleeping through the night, I was up at least once and slept for only about 6 hours most days this week…not ideal. In fact, I’m writing this post in the middle of the night. I also forgot to make my massage appointment (a birthday gift) every day despite adding an alarm on my phone to remind me. What I didn’t do this week was tell my husband what was going on, which was intentional and different from my usual actions. I told him about the stress and even asked him to pray for me, but I didn’t give him any specific information. It started out with me not wanting to relive what was going on, then I just did not want to verbalize the negativity. I did verbalize my discontent while at work, respectfully and multiple times, but I didn’t want to cross that boundary of bringing that energy home. I will now jump to the sweet stuff. I notice my writing trend of ending on a good note, like happily ever after. Seriously, I think it’s important to search for the light spots amongst the chaos and sometimes darkness. Otherwise, I would get stuck in chaos and darkness and I don’t want that. Learn and move on. That might be my new motto. This week, I managed to read all my devotionals, exercise 6 days in a row, had a daily green smoothie, made my weekly fitness coaching session, took all my supplements, was given some flowers, did some leisurely reading which is a favorite pass time, made some connections with people, encouraged some people, checked in with some people, and loved on some people including my family. All that and I still have Saturday!